Gnocchi comes from Italy and are potato dumplings that melt in your mouth. They take some time to make but are a special treat that I like to share with my husband. When I worked at Sattva bakery here in Stockholm, I asked my Italian colleague if she knew how to make gnocchi. She learnt it from her mother and offered to teach me. I jumped at the opportunity, of course! I was surprised how simple it was -- she just boiled potatoes until fork tender, peeled them while hot, mashed them, and shaped them into a ball with the help of some flour. Then she boiled them and sauteed them simply in butter. 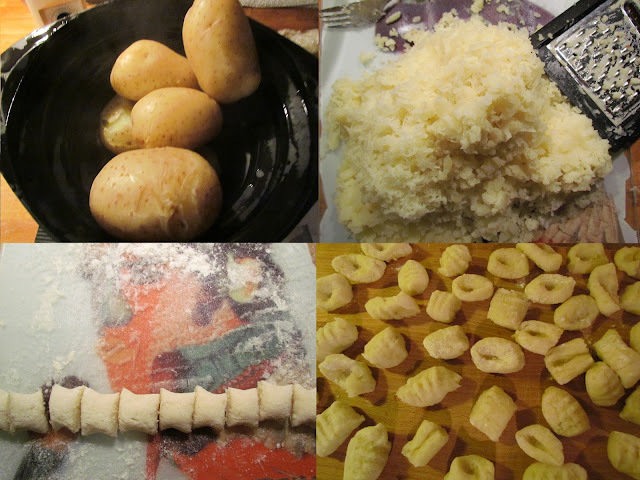 It took me a few experiments before I could make excellent gnocchi. My trick is grating the potatoes, which ensures a lump-less gnocchi, and guarantees melt-in-your-mouth softness. One must also work while the potatoes are hot in order to get the proper dough consistency. Adding too much flour can result in a dry, tough gnocchi. A tool that definitely helps is a weighing scale. Once the dough is made and the gnocchi is shaped, it can rest covered under a towel for hours until it is ready to be cook. Uncooked gnocchi can also be dusted with flour and placed in a freezer bag in the freezer for later use. I serve gnocchi in a light cherry tomato sauce that helps balance its richness with the tartness of tomatoes. A few shreds of mozzarella doesn't hurt either, and fragrant basil is a must! 1. In a large pot, place the potatoes and cover with cold water. Boil until fork tender. 2. Drain the potatoes. On a clean work surface, peel a hot potato and using the large hole on your grater, grate the potato. Continue in this fashion until all the potatoes are grated. 3. Sprinkle the grated potatoes with salt and flour. Knead the until all the flour is absorbed and it starts to look like a proper dough. Sprinkle with extra flour if it's sticky, but it's important not to use too much flour, or it will yield a tough gnocchi. 4. Divide the dough into lemon-size balls. 5. On a flour dusted surface, roll each ball into a log, about 1 inch thick. Cut into 1 inch pieces. 6. Dust a fork with flour. Run each piece along the back of the fork so that it forms the fork's indentation and curve the last edge of the gnocchi inwards so that each gnocchi has a little hole in the center -- to catch the sauce. 7. Place the gnocchis on a floured sheet and cover with a towel until ready to boil. 8. Cook the gnocchi, in batches, in boiling salted water. Once they float to the top, give it 10 seconds and scoop them out and into the sauce. Shred in some fresh mozzarella if desired. 1. Heat the oil and add garlic and red chili flakes. Stir until fragrant but not brown, and add the cherry tomatoes. Cook until the tomatoes become soft and juicy, on medium-low heat. Season with salt and pepper. Turn off heat and tear in basil.